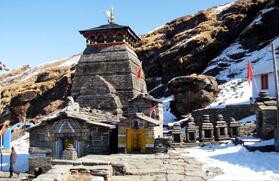 At Trekking in India, we offer Source of Ganges Trekking Tour, which is about a week's long. 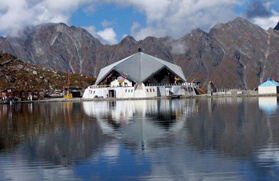 Right from self-supported journey to camping in Himalayas, our travel tour will give a lifetime experience. 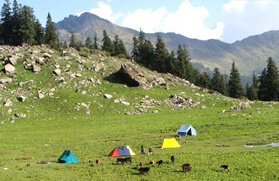 The trekking route will take you through the lush green forests and beautiful meadows. 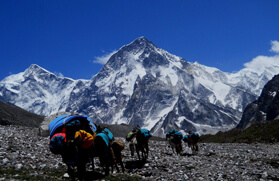 So, plan your adventure holiday and visit this trek at least for once in the lifetime. On arrival at Delhi airport meet our executive and transfer to pre booked hotel. Overnight stay at hotel. Early in the morning transfer to New Delhi train station and from here catch AC Shatabdi train for Haridwar at 06:45 hrs. Arrival at Haridwar by 11:25 hrs. Here meet our guide and drive to Rishikesh by road which is 25 kms and will take 45 minutes. Check in to the hotel and relaxed. By evening visit the famous Laxman Jhoola, Swarga Ashram and Parmarth Niketan for Aarti ceremony on holy river Ganges. Overnight in hotel. Day 03: Rishikesh - Uttarkashi 1150 mts. In the morning after breakfast drive to Uttarkashi. 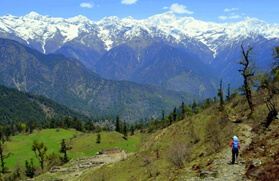 The drive along the ridge line to Chamba, affords panoramic views of the high mountain peaks of Garhwal. Then down to Tehri to join the Bhagirathi river valley, which we follow upto Gangotri. Overnight in Tourist Bungalow in Uttarkashi. Day 04: Uttarkashi - Gangotri 3048 mts. After breakfast drive to Gangotri, following the torrential river upstream, the road winds up the valley past the hot sulphur springs at Gangnani, to climb steeply up a series of hairpin bends to the village of Sukhi. On arrival at Gangotri check in to Guest House. Overnight stay. Day 05: Gangotri - Chirbasa or Bhojwassa 3350 mts. An easy walk (13 KMS TREK). The wide trail initially passes through dense deodar forests before emerging into the wide unfrosted valley. It then carries on to a small isolated forest of pine at Chirbasa, literally the abode of pines. 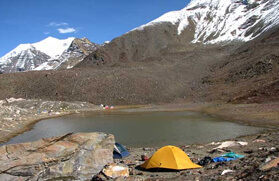 Camp on a grassy meadow beside the Bhagirathi. 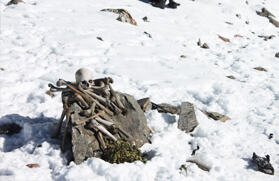 Day 06: Bhojwassa - Gaumukh 3850 mts. Continuing along the pilgrim grassy hillsides. Trail then curves, to unfold a breath-taking view of wild flowers studded meadows crowned by the Bhagirathi group of peaks Camp on a wide sandy beach at Gaumukh, where the holy Ganga gushes out of the snout of the Gangotri glacier, is set in a wide moraine-stream valley Shivling 6540 m, sits looking down like an old learned man, while the Bhagirathi I, II and III tower above. Trek time : 5 hours, 4 KMS. Day 07: Gaumukh - Tapovan 4350 mts. 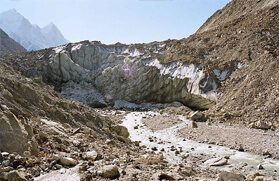 The trail leaves its way through the terminal moraine before cutting across the Gangotri glacier and climbing steeply up to the grassy slopes to the vast ablation valley of Tapovan. 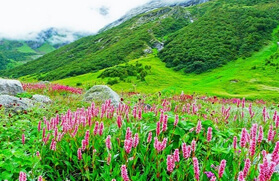 The vast meadows strewn with wild flowers are situated at the base of Shivling. 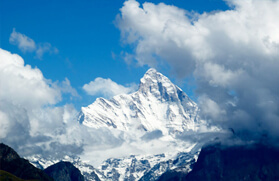 The Bhagirathi peaks are now almost within touching distance. 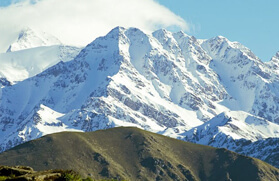 Camp is set in the heart of high mountains country for 3 nights. Trek time : 5 hours, 5 KMS TREK. This Day is largely an exercise is boulder hopping. 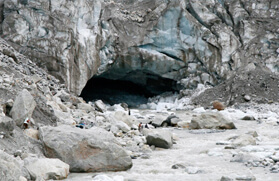 Crossing the moraine covered Gangotri glacier to Nandanvan located at the confluence of the Chaturangi and the Gangotri glaciers. Literally meaning the four coloured glacier. The Chaturangi is truly multi-hued. 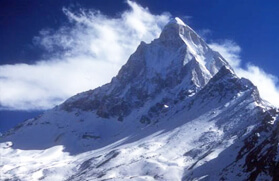 The massive meadows of Nandanvan are situated at the base of the Bhagirathi massif. The area provides excellent sightings of Bharal (blue sheep). Overnight in camp. Trek time : 6 hours, 7 KMS TREK. 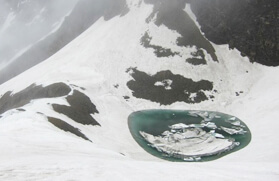 Day 09: Nandanvan - Vasuki Tal 4800 mts. 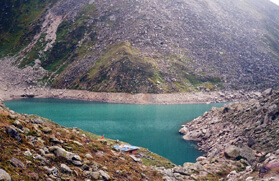 A full Days walk to the picturesque Vasuki Tal lake. 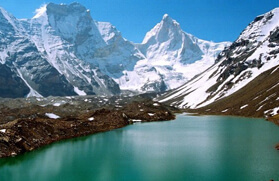 The trail follows a grassy ridge running parallel to the Chaturangi glaciers, across a small glacier eroded valley to Vasuki Tal. 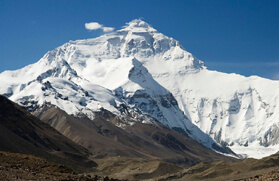 It then continues along the lateral moraine of the Chaturangi glacier to views of Mt. Satopanth. Return to camp. 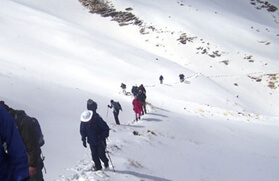 Retrace steps to Gangotri. Drive to Uttarkashi. Overnight in hotel. In the morning after breakfast drive to Haridwar and from here catch evening Shatabdi train for Delhi at 18:05 hrs. Arrival at Delhi by 22:45 hrs. Here meet our executive and transfer to hotel. Overnight stay.